I've pinned two versions of this recipe on my Pinterest recipe boards and they're both very similar. This one uses lettuce, but I made this version with no lettuce. 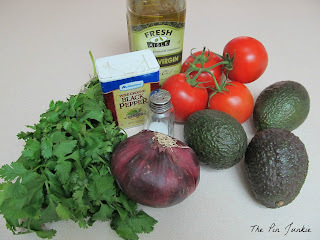 It's basically the same ingredients you would need to make guacamole. 1. 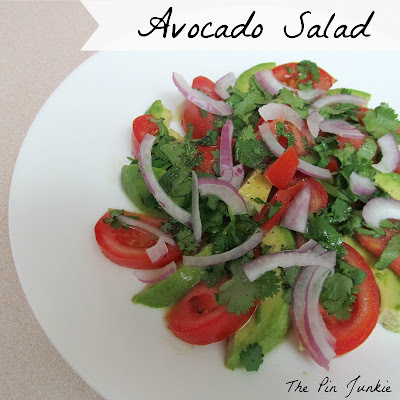 Slice avocados, onion, cilantro, and tomato. 2. Combine lime juice, Tabasco sauce, and olive oil. Drizzle over salad. It's really important to use ripe avocados. When choosing avocados, I look at the color of the skin. 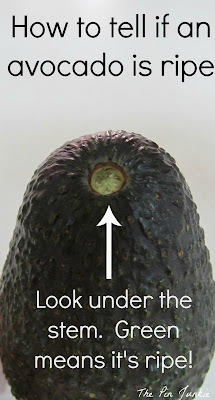 If the avocado is bright green and rock hard, it's not ripe yet. If the skin is almost black and the avocado is very soft, then it's too ripe. A nice dark green is what you're looking for. Also, when you gently squeeze the avocado, it should give just a little. On Pinterest, I found another good way to tell if an avocado is ripe. Just look under the stem! It's one of my favorite salad ever!